I mentioned last week that the large Pied Oystercatcher family that had successfully raised three chicks this year for the first time may soon become a smaller family group. The three juveniles are over three months old and independent, but were still roosting and feeding with their parents on Wednesday 3rd December. They were wandering further apart and I knew that it would not be long before the family group became smaller. I did not know if all of the juveniles would go together or if they would go one by one or if different sexes would leave at different times. 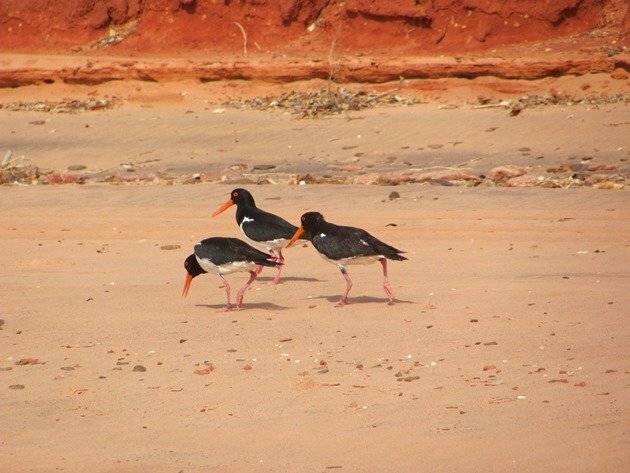 There has never been more than one Pied Oystercatcher chick raised to become independent in the Broome area in the 15 breeding seasons that we have lived here, so it was all new information. We do know that at about the three month time period they do wander off on their own to join the large flock to the south of Roebuck Bay or wander north to join a flock near Willie Creek. On Thursday there was only one juvenile Pied Oystercatcher present and somewhat distant to its parents. It did react to their calls, but preferred to keep to itself. 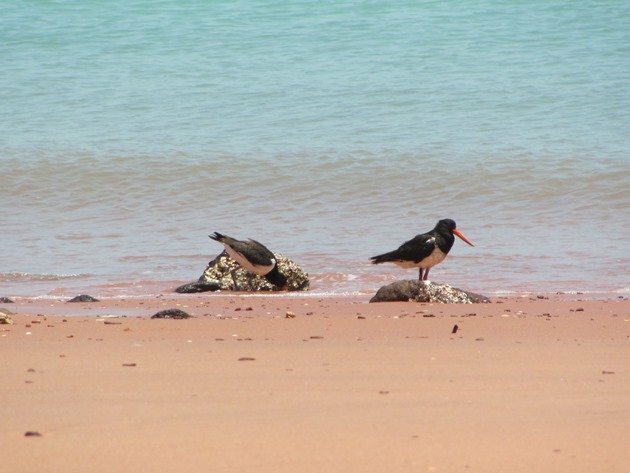 The arrival of an adult Pied Oystercatcher to the beach caused a stir, though. The adults immediately started their “piping” with bills to the ground and strong vocal calls as they chased the intruder around me. The juvenile Pied Oystercatcher then joined in the commotion and it was quite a spectacle! 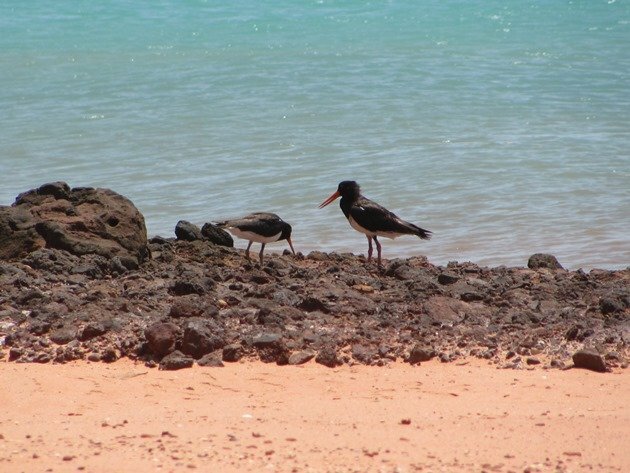 Within a few minutes the juvenile Pied Oystercatcher walked off and left them to it and walked around me to stay high on the beach until the intruder was chased off and then all was quiet on the beach once more. The tide went out, they fed separately and I walked back along the beach observing the many other thousands of shorebirds. On this long stretch of empty beach there are currently Easter Curlew, Whimbrel, Great Knot, Red Knot, Bar-tailed Godwit, Curlew Sandpipers, Grey-tailed Tattlers, Terek Sandpipers, Common Greenshank, Greater Sand Plovers and Lesser Sand Plovers. Gull-billed Terns and Silver Gulls are the stand out “white” among the roosting shorebirds with the occasional Black-winged Stilt. 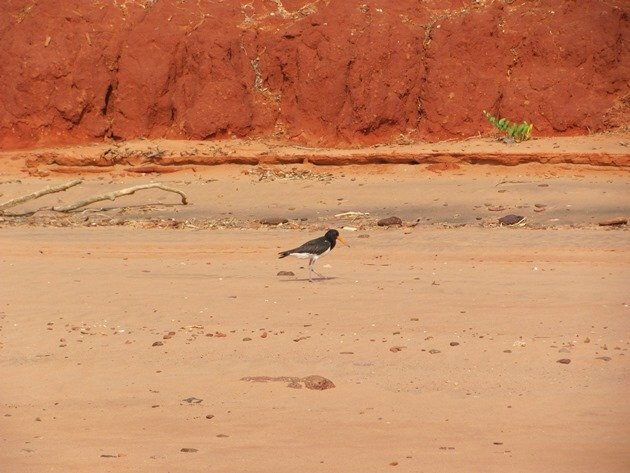 Juvenile Pied Oystercatcher wanders off-confused?! 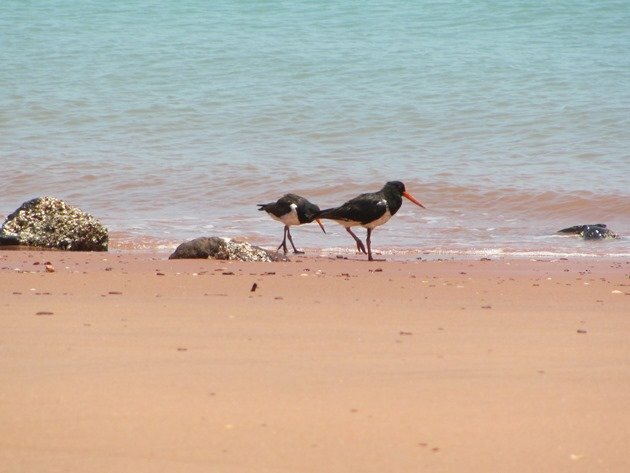 On Friday I was unsure if there would be any Pied Oystercatchers left on the beach, because the adult birds will return to their territory once all of the juvenile birds have moved on. There was still the one juvenile Pied Oystercatcher and it remained distant most of the time. It appears to be unsure about leaving at the moment. It reminds me of a teenager, who wants to be independent, but then runs home when things don’t quite go to plan. The juvenile Pied Oystercatcher would either be on its own with its back to its parents or it would run over to them as if looking for assurance. It had a lowered neck and head as if in a submissive position, which is intriguing. 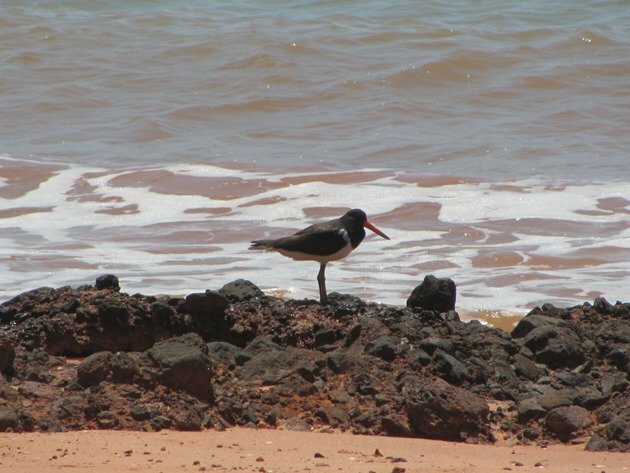 No doubt it really is only a matter of days now and the Pied Oystercatcher family group will have dispersed completely. 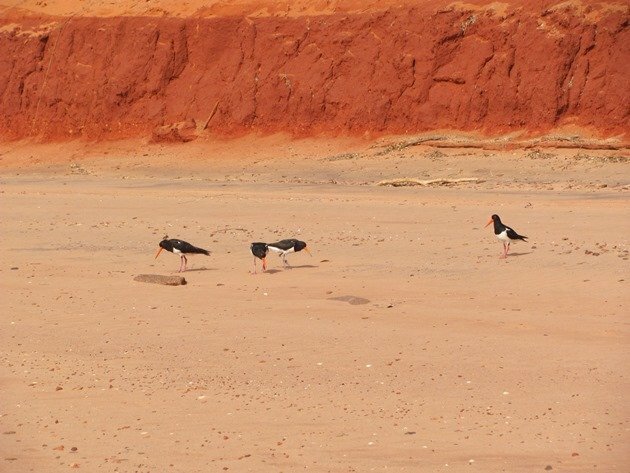 I hope you don’t mind that I have only written about one family of Pied Oystercatchers for three weeks now, but this is rather a special breeding event in Broome and has been a pleasure to observe over the recent weeks. SUNDAY EVENING UPDATE-Broome Time! I walked to the Port from Town Beach today and the Pied Oystercatcher family were gone, so in the late afternoon once Grant had finished work we went to Gantheaume Point hoping to find that the parents had returned to their breeding ground. Well they had returned to Gantheaume Point, but they had not lost the one remaining chick….it does not want to leave its parents yet and they don’t want to lose their breeding territory. Now it will be interesting to see how long it stays with them! We don’t think it will stay until they breed next July, but we just don’t know! It won’t breed for more than 7 years. Thanks for such an interesting post, Clare, and great photos, too! Your observations of their behavior are fascinating. I will stay tuned to find out what happens next! 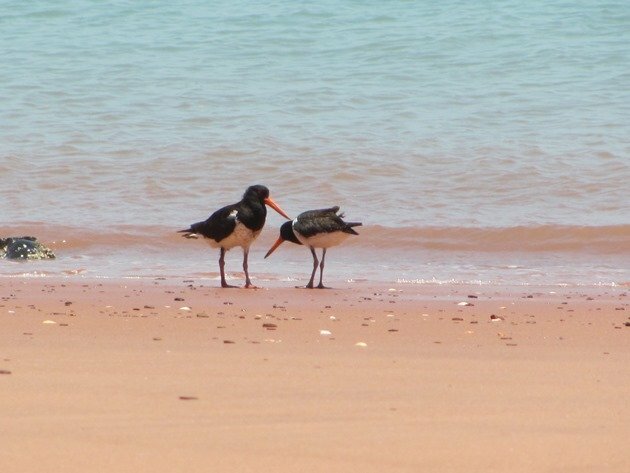 I definitely don’t mind your continued writings about the oystercatchers. I’ve enjoyed reading about them.